Gorgeous earrings made with beautiful lime green murano glass, made in the traditional lampwork method. These earrings are hand made in venice by master venetian artists. 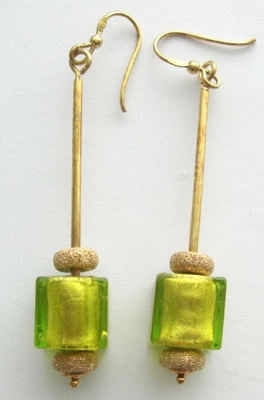 The earrings are set on sterling silver with gold and have beautiful sparkling gold beads to compliment the lovely bright green. These earrings are genuine murano glass and come with its their own box and certificate of authenticity.